While we’re waiting here in the U.S. for the Peterson pod to float its away across the pond with the new army-mount lines, I thought I’d take a look back at the Natural Army Linseed Blast, another line from Mario Lubinski (Lubinski.it), Peterson’s Italian distributor and long-time partner. Lubinski is sort of like the Fifth Beatle, the George Martin of Peterson, for those of you old enough to appreciate the cultural reference. He seems to intuitively know what makes Peterson Peterson and then goes straight to the heart to bring fresh interpretations out of their long-standing design language. Nowhere is this seen so clearly as in his many variations on Peterson’s army-mount pipes, which I first came to know when we set about doing research for The Peterson Pipe: The Story of Kapp & Peterson some five years ago. At the time Ebay was running about 600-700 hundred Petes on their site on any given day (less than half of what’s now available), and I came across what appeared to be a 302 System that purported to be a Peterson. It was my first glimpse of what Peterson has been doing in Italy since the late 1970s. Using AlPascia’s YouTube videos as my source, it appears the Army Linseed Blast appeared in late 2010. Like all Lubinski Petes, it has a sterling ferrule and a black (or later, marmalade) acrylic fishtail stem stamped with a hot foil P. Like many of his lines, the shapes delve heavily into the treasure-chest of B shapes, drawing on whatever Special Collection or Limited Edition bowls might be available. The XL12 pictured at the top, originally the Baskerville from the first Sherlock Holmes series, is a typical entry, although there were a few non-army mounts, like the 264 shown above. Someone suggested in an old forum post that Linseed Blast pipes were oil-cured, but I have my doubts. Peterson has just never done that kind of out-sourcing. The line is, however, very Italianate in other respects. If you know the work of Radice and some of the other artisan Italian makers, you’ll have an “Ah-Ha!” moment as you look again at the “clear” finish on these. The blast on this shape—which is the Large Tankard from the Mark Twain Collection—is mind-blowing, keeping in mind that this is a Peterson pipe! Whoever was responsible for this one really knocked it out of the park. I had a B37 Army Linseed for awhile, but it didn’t work out for me and I had to pass it forward. Don’t think that’s a criticism of the line, however, because I’ve also owned Limited Editions, a Royal Irish, and some fairly high-grade artisan pipes like Claudio Cavicchi, Paolo Becker, Larrysson and others that I couldn’t come to terms with. I will say that I didn’t care for the un-laquereed, matt finish on the Army Linseed where the bowl has to be smooth to allow for the COM and shape stamp – it made the pipe seem cheap, somehow. And to be honest, they weren’t all that expensive, running about $130 if memory serves. While the Linseed blast pipes have disappeared from the retail market, their legacy continues in the 2016 army-mount invasion from Peterson. And now that Peterson has reinvigorated the Army lines, let’s hope they follow up next year by refitting their tall ships—the Systems! 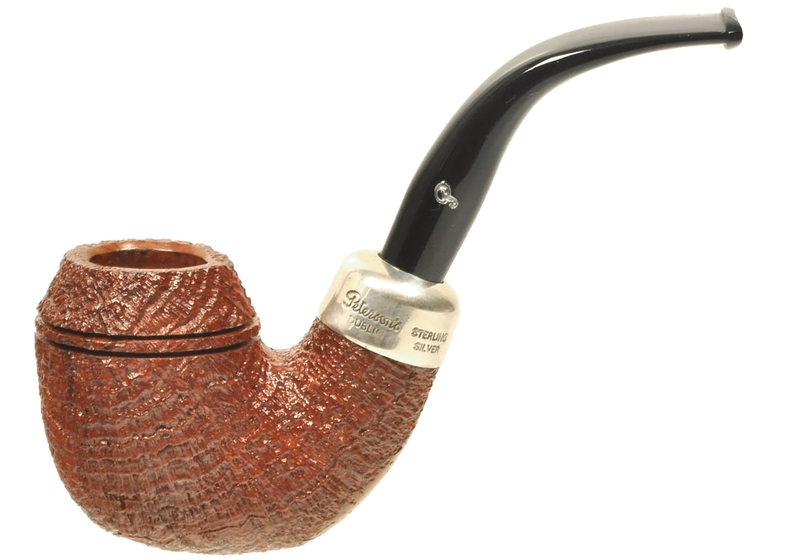 If I’m not mistaken Peterson had made one Founders Edition pipe in the linseed finish. It was very sharp looking. Thanks, Marc! I’m going to see if I can post the photo you’re referring to. Really fantastic. Love that B47 Mark. It’s a beauty. Thanks for sharing. Ho appena letto il tuo blog, usando Google Translate, e non sapevo che il Peterson Army Linseed fosse una radica di OLIO! Molto interessante!! Grazie.